The Rogozarski IK-3 was Jugoslavia's first low-wing, retractable landing gear fighter. It is in many ways similar to the British Hawker Hurricane in its construction, having a tubular frame fuselage with metal coverings in the front and fabric in the rear. Production aircraft had a 920hp license built Hispano-Suiza 12 Ycrs V-12 liquid cooled engine. This produced a top speed of 327 mph at altitude. Armament was one 20mm cannon and two 7.92mm machine guns, all mounted in the nose of the aircraft. The prototype was flown in the spring of 1938 and after a year of trials, an initial production order of 12 airframes was made. The first of these airframes was delivered in the summer of 1940. It was found that local pilots preferred the IK-3 to the Hurricane I and Bf-109E-3 that were currently in service. Despite this, the Rogozarski factory was to produce 100 license built Hurricane Is before a second production batch of 25 IK-3s were to be delivered. This batch had just started delivery in 1941 when the German invasion stopped all production. The six surviving airframes from the first production order were thrown into battle alongside Jugoslav Bf-109E-3s and were able to do rather well before the country was completely overrun. Rather than unwrap and show you the parts of this kit, take a look at the parts breakdown as shown above. The kit is molded in the standard tan resin and is well detailed. The detailing is a bit shallow, though so any sanding and other work will quickly erase what is there. There is some detail on the inside of the fuselage in the cockpit area. My copy had several rather nasty air bubbles on the trailing edges of the elevators which will have to be filled. The wing is a single piece, which is nice, but will also make for a rather heavy model. All of the smaller pieces you see listed as A, B and C are imbedded in resin wafers. This generally means that there will be fewer air bubbles in the parts. The kit also supplies two vacuform canopies for those of us who really need that second one. The instructions are quite adequate consisting of 4 exploded view steps. Some color information is given though in generic terms as I'm pretty sure there is no surviving example nor color photographs of an IK-3. It really looks like quite a simple kit to build as there are not very many parts in it. The builder may want to consider replacing the landing gear with aluminum tubing to handle the weight of the kit, though I have several 1/48 resin kits that are holding up well after about 3 years. There are decals for one aircraft, flown by Dusan Borcic who got a kill during the German invasion. The aircraft is painted "in a two-tone scheme based on accepted artists' renderings of this particular aircraft". It is dark earth and dark green over light blue grey and FS equivalents are given. The IK-3 could also have operated in a three tone upper scheme as used by Jugoslav Blenheims. The choice is yours. Decals are by Propagteam so should work quite well indeed. To my knowledge, this is the only kit of this plane in 1/48. 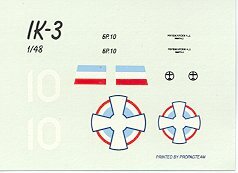 In 1/72 there is a short run kit by Aviation USK. If you would like your product reviewed fairly and quickly by a site that averages over 2,000 visits a day, please contact me or see other details in the Note to Contributors.